180° FISHEYE LENS + 25X MACRO LENS: The extra bonus Macro Lens which includes fixed-focal-length glass has been updated compared to the other 10X ones in the market. Much more perfect and easier for photographers to take close-up shots of tiny objects clearly. Fisheye Lens provides you incredible and dramatic rounded images without dark corners, which takes you into the stunning and fantastic world. 0.36X SUPER WIDE ANGLE LENS: Amir Wide Angle Lens enables you to take pictures of large ranges, such as group of people, buildings and landscape. No more worried to miss any people or landscape in your photos. 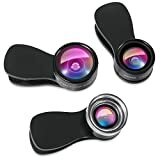 PROFESSIONAL 3 IN 1 LEDS: Constructed with Superior grade glass optics and solid aluminum, this phone camera lens is easy for you to take better photograph and capture the instant beauty on your cell phone. PORTABLE: Together with lens cover for each lens, effectively to prevent dust, easy to remove. Lightweight and mini size, the fisheye lens are great for keeping inside your wallet. WIDE COMPATIBILITY: Universal detachable clamp design, work on all popular brands and models of smartphones and tablets or anywhere you can imagine. Soft rubber clip will not scratch or damage your mobile device.It can apply for iPhone 7/ 7 Plus/ 6s/ 6s Plus/ 6/ 5/ SE, iPad Air, iPad Mini, HTC, etc. -Features: Macro lens can take clear photos of small objects. -Note: In order to get a stunning effect when using this Macro Lens, you need to place the transparent cap on the surface of object that you want to shoot, make sure you don’t block your light source and keep 1/2″ (13 mm) distance from the shooting object. -Features: Wide Angle lens can shoot larger range of scenery. -Note: When shooting pictures, it is suggested that the Wide Angle Lens be used in a wide-open area in order to get better photos. -Features: 180° of the scene can be captured by Fisheye Lens, which takes you into a stunning fantastic world. -Note: Be sure that the lens is adjusted right in front of the camera lens of your smart phones, avoiding some blurring photos. Note: The Flash Light might be blocked when using the lens. It depends on what kind of cell phones you use.